High Flying Bird is a chatty sports drama from Oscar winning director Steven Soderbergh. It addresses a broad spectrum of issues facing black athletes in the National Basketball Association. The film also intercuts interviews from current NBA players about their rookie experiences. High Flying Bird uses the premise of a player lockout by the owners to show inequity. It's well acted and directed, but struggled to keep my attention. Heady themes are addressed, just not in an interesting way. 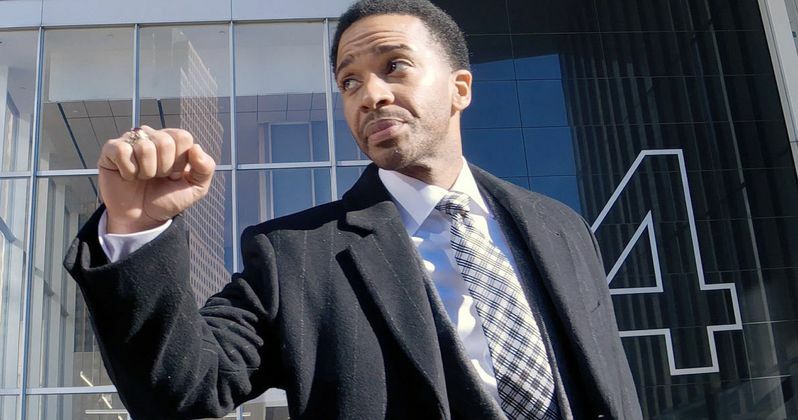 High Flying Bird opens with a savvy sports agent, Ray (Andre Holland), chastising Erick (Melvin Gregg), a young client about to start his professional basketball career. The players have been locked out by the owners. Erick has a signed contract, but has not received any money. He has unwisely borrowed money from a shady source. Ray gives Erick a sealed envelope containing the "bible". Ray tells Erick he'll know when to open it. Ray returns to his high powered agency in chaos. The NBA lockout has affected the bottom line. His priggish boss (Zachary Quinto) has cancelled all spending accounts. Ray's job is in danger. Ray goes on an odyssey through New York City with his former assistant (Zazie Beetz). He talks to the players association representative (Sonja John). Then remembers he promised to bring Erick to the charity shootaround of his mentor (Bill Duke). Erick has a confrontation at the event with another star NBA player. Their streetball conflict gives Ray an intriguing idea. High Flying Bird is about racial disparity. The film takes a historic look at the NBA, and how the system ended up in modern times. There are many comparisons to slavery, which Bill Duke's character keeps front and center. The players are a commodity. The owners have the wealth and power. The field needs to be levelled, but not every player has the same talent. How can the lockout end when everyone is fighting for their piece of the pie? Ray's solution is the crux of the film. It just takes forever and a day to get to this point. High Flying Bird is written by Tarell Alvin McCraney, who won the adapted screenplay Oscar for Moonlight. The film has heavy hitters behind the camera. Steven Soderbergh shoots the characters tightly in frame. The ensemble goes back and forth in their dealings. High Flying Bird is essentially a series of conversations. The loquacious script has a lot to say about the state of race in professional basketball. There's no denying the merits of the story or its artistic value. The problem is that it's boring. The film is only ninety-minutes, but feels much longer. High Flying Bird is informative, but not entertaining. Soderbergh unfortunately delivers a real snoozer. High Flying Bird is cerebral to a fault. The lack of dynamic action grinds the narrative pace. It's painfully slow. I appreciate the message, but found the film lacking. Even the asides from the current players are dull and monotonous. Soderbergh and McCraney succumb to preachiness. High Flying Bird premieres February 8th on Netflix streaming service.